I’m forever seeing articles on websites, in newspapers and magazines about the body language of dating, but very little coverage is ever given up for body language in the workplace. After all, most of us spend about thirty or forty hours a week working and most of us have to do it alongside other people. So it makes sense to understand your colleagues and clients almost as well as you understand the moods and attitudes of your friends and family. That’s simple, the more you understand people’s attitudes and emotions about anything, the more options it gives you as to how you handle them. The better you handle people and situations, the more progress you make in your career. I’m sure you can spot the people in your organisation that have a “Can Do Attitude” and those that don’t. And I’ll bet that those that have the “Can Do” attitude have completely different body language to those that don’t. The “Can Do” person also seems to know just how to handle other people and all manner of situations instinctively both in their personal and business lives. The “Can Do” person is the one the gets noticed and usually promoted, they may not always be good at their job but they have the knack of getting noticed by the right people, who then believe they are right for the job. The key to having a “Can Do” attitude is to understand the people around you, how they tick, what they want out of their job and life in general. The more you understand people the easier it becomes to have a “Can Do” positive mental attitude because understanding their Non verbal signals, movements and gestures gives you insights into their future likely behaviours. This can alert you to upcoming trouble, giving you the opportunity to avoid it by doing something different before it gets to that point or you could even amplify someone’s good mood about something to motivate even more. Start by taking the time to just observe other people in your work environment. Look at them when they’re talking with others, notice any differences in how they speak with different people. Are they different with the boss to how they are with you? Are they different with men and women? Are they different with confident/shy people? You’ll know who the best person is to help you with a particular problem, who’s the best person to give a certain job that has a specific deadline and who’s the most reliable. After all the old saying; “Actions speak louder than words” is oh so very true, as no business can function and survive without the people in it taking action. “Can Do” people show they “Can Do” things by the way they act most of the time. Their posture reflects their confidence in their abilities to do whatever is necessary, consistency is the key to reading people. Posture is one of the first observable behaviours you can see and research by the British Chiropractic Association found that 61% of people equate good posture with confidence and true confidence comes from the belief in their own competence to “Do” things. Eye contact is another important area of the body language of the “Can Do” person because in most cultures, not all, maintaining good eye contact is a sign or respect. It also shows they are actively listening and taking note of what you say, plus if they’re looking at you, you can read their facial expressions, as you give them instructions or ask their opinion. Nodding and shaking the head in the right places shows active listening too and “Can Do” people are for the most part good active listeners. These are just a few simple areas of easily observable behaviour that can help you in your business by getting the right people to the jobs you need doing to keep your business running at the top of its game. “Can Do” people keep Companies alive without them you have a “Can’t Do” Company and that will kill your business. Yes, it's finally here, well very nearly! talking ten-to-the-dozen, jabbering on about how innocent they were, Phippsy just watched....their eyes, the way a foot was jiggling up and down, their hand movements. Because those people knew they'd been found out once The Body Language Guy stood up. They learned the hard way that it's not just what comes out of your mouth that communicates, it's all those little things you do while talking, that scream even louder! I've learned so much from him over the years. and communicate with others....start reading! After all, Phippsy is definitely one of the best Body Language experts around....."
it contains are truly powerful and worth many times the small cover price." "Robert's understanding of his subject is deep and thorough - he knows what he's writing about. Plus, he can communicate that knowledge, so that every reader can put it into practice and have it make an immediate difference to everyday life. Clear, helpful, packed full of facts, insights and interactive exercises, this is the book you need if you want to master body language." "Recognising what you - and others - are doing with body language turns 'instinct' into powerful knowledge. 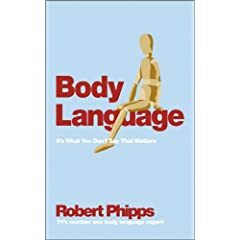 In this book Robert Phipps can help us all, at work and play, use body language to our advantage. Even learning one thing, such as looking above the bridge of someone's nose, could make a difference. read and see how."